Modifies the Default Connection type to ‘Other’ and Increases the connection speed. Provides Full Support for Proxy Connections i.e Configure Proxy Address and Port. Uses SOCKS4 and SOCKS5 protocols to Secure the Downloading Process. 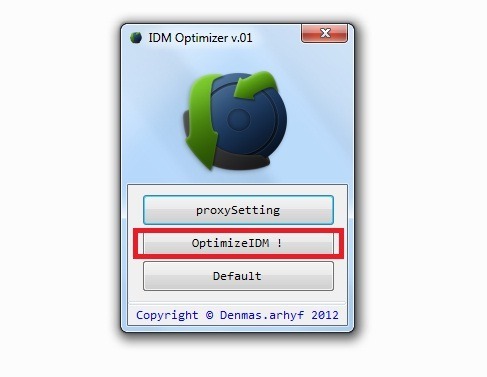 First of all You need to Download IDM Optimizer on Your System ( Download Link ). It is an .exe File therefore there is no Need to Install it Just Double Click on the .exe File. Note – Close all IDM Applications and Exit the Internet Download Manager from Tray Icon before applying the below Steps. A new Window will Pop up and Click on Optimize IDM as shown below in the Image. Restart Your IDM and Your Computer/PC. Note – If You Experience Low or Poor Download Speed after Optimizing the IDM Settings then you can change the Settings to Default by Clicking the Default Button in IDM Optimizer. That’s it and now you will be getting much faster speeds. how to download torrent file with idm ? plz help me on running the optimizer .exe file it shows that ( you first must install one of the following versions of the .NETFramework. nice site,thx for sharing info. I have some Versions of IDM but not able to find which IDM version has 32 Connections Option. Every version is showing Maximum 16 Connections not more than that. Kindly send me the link of IDM which has 32 Connections Option.